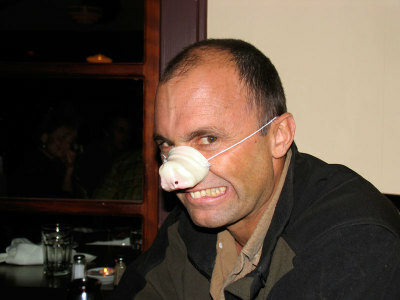 Guillermo is pictured here with the pig noses that graced each table setting. * Justin's pork products (cuts, sausages, patés, etc.) are sold at farmers markets in the Santa Cruz-Silicon Valley area weekly. You can check his market schedule here. "Surfing Farmer" to Carlo Petrini: "Whatevah!" THIS POST IS AN EDITED VERSION OF ONE THAT APPEARED PREVIOUSLY. UPDATE: May 17. I talked to "Surfing Farmer," who had left a comment in response to this statement by Petrini. Surfarmer was, at the time, able to laugh but was still a little bugged by it, because he's sort of well-known as being the surfing farmer up at the market in San Francisco. As he told someone on the phone, "Even if it's not me, people think it's me." But in hindsight, he asked that I remove the comments, which I admit I made worse with my own attempts at thumbing my nose to the person who would write such things about my friends who farm. So I removed it, because as he further revealed to me, Surfarmer is about to announce his candidacy for President of the United States, and wants all evidence of his goofball sense of humor eradicated. Oh, if only Google would comply. The remark I found most offensive was about the "young dropouts-turned-farmers." Most of the farmers I know have college educations: many have graduate degrees. I would be willing to bet that Bay Area farmers are among the most educated in the world, if only because the University of Santa Cruz's farm apprentice program has been turning out organic farmers for forty years. Many of the graduates, of whom Surfarmer is one, stay close by—because the support is here. We do love our farmers, don't we? I'm sure the maelstrom will continue when Steve Sando publishes his account of his meeting with Carlo Petrini at CUESA. I'm sure he will keep an eye on the situation. Gasping for Breath: One More Day! This photo was taken up in Petaluma, in the Twin Rocks valley, at Canvas Ranch earlier this month. I found it on my desktop and thought it would look nice. Since I am still laid up with bronchitis, no farm visits for me this week. So today: tidbits from all over. This is a temporary position (6-12 months) beginning in December 2006. Located in Jackson State Forest in rural Mendocino County, 10 miles east of the coast, Old Mill Farm is an off-grid small family farm. Diversified production includes pastured pigs, 25 sheep, a year-round market garden, and a one-acre vineyard. We are seeking a replacement farm manager to begin as soon as possible, who will work closely with the business manager and garden manager, and have primary responsibility for the maintenance of all farm infrastructures and animal husbandry. Housing, partial board and salary provided. You can download the rest of the details in this 56K PDF: OldMillFarm.pdf.